This product requires the base game Lords of the Fallen - Digital Deluxe Edition. Lords of the Fallen ©2014 CI Games S.A. All rights reserved. 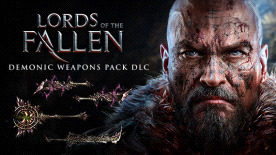 Lords of the Fallen is a trademark of CI Games S.A. Fledge Engine ©Deck 13 Interactive GmbH. Used under license. Powered by Fireflight Technologies FMOD Ex Sound System. Copyright in the Enlighten Is owned by or licensed to Geometrics Limited All rights reserved. PhysX Technology provided under license from NVIDIA Corporation. @ 2002-2014 NVIDIA Corporation. All rights reserved. @ 2014 Valve Corporation. Steamworks and the Steamworks logo are trademarks and/or registered of Valve Corporation In the U.S. and/or other counter. The NVIDIA logo and the "The Way It's Meant To Be Played" logo are registered trademarks, of NVIDIA Corporation. Copyright @ 1997-2014 NVIDIA Corporation. All rights reserved. NVIDIA Corporation, 2701 San Tomas Expressway Santa Clara, CA 95050 USA. All other copyrights and trademarks are the property of their respective owners.